In Germany you could touch and feel the excitement before the Brazilian Grand Prix. Not only two Germans in the front row, but brothers to boot! Germany was making history in Formula One! In the studio in Cologne were display models of the Ferrari and the BMW Williams, both emblazoned with the Schumacher name. Nor was the race result anything for Germany to complain about. A BWM Williams led the race, a Mercedes won it, and at the finish two Germans were on the podium. Interestingly, only 42 percent of the TV viewers in Germany credited McLaren Mercedes with the ability to catch up to Ferrari this season. They must have been bemused by the race result. I don't feel that it was indicative of what we'll be seeing in Europe, in the early races anyway, but it was a great shot in the arm for the hard-working McLaren crew, especially after Mika Hakkinen's disastrous non-start. The historic pairing of two brothers in the front row will have much wider and deeper implications in the future. These brothers work actively together on issues that interest them, both with and without the guidance of their joint manager Willi Weber. Let me give you a specific example: the issue of the Schuberth helmets. These helmets are made by a company in Braunschweig. Their head of development is a creative young engineer named Schimpf, the son of a successful Porsche racer. The reason the brothers are insisting on the use of Schuberth helmets is that Schimpf has introduced radical new features that are unique to these products. The exterior shape is part of the equation. The shape of the helmet is such that Ferrari's wind-tunnel tests have confirmed a significant improvement in power output because the airflow around the helmet and into the airbox is notably better. The helmets are also lighter, an obvious advantage with the high lateral G loads suffered by the drivers. In addition, they are equipped with a cooling system powered by a separate battery and, to top it off, they have a built-in indicator for engine revs to help the driver keep the V10 in the optimum power range. In the development stage at Schuberth is a laser detection system that will give the Audi drivers at Le Mans signficantly enhanced night vision. So you can forget about the 'safety' arguments put forward for the helmets, except in the broadest sense. They are engineered to help their wearers perform better, quite an advantage at a time when differences among cars and drivers are so small. So we see the Germans breaking into the helmet business in a big way with the help of advanced technology. What's next? 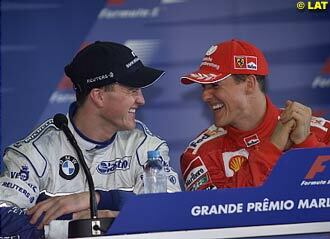 Can you see anyone refusing to supply the Schumacher brothers with their latest and best products and systems? Where else can you imagine Formula One drivers working closely together to achieve better results, even if they aren't brothers? Can you picture the Italians doing it? The British? The French? I could see some of the Brazilians getting together to win an advantage, especially if it meant gaining ground on a certain Colombian. But otherwise drivers tend to be lone wolves, operating only for their personal benefit. Under those circumstances, the Schumacher freres will pull out a distinct advantage. These are positive developments for the Germans in Formula One over and above the obvious progress being made by their car and engine makers. Mercedes showed a determination to stay in contention at Brazil, and BMW confirmed its spectacular progress. A German is responsible for the group for which the Jaguar team races and he has put an Austrian in charge of his performance operations. A German company owns a substantial share of the trust that controls Formula One and has sold an interest on to another German company. German auto companies are prominent among those that would like to buy a bit more of that trust. And the newest entrant to Formula One, Toyota, is based in Cologne, Germany. Come to think of it, the Germans aren't coming. They're here! A couple of other comments on the race in Brazil: I'm greatly indebted to David Coulthard, because he has kept intact Alberto Ascari's unique string of seven consecutive victories, something that's featured in my recent book about Alberto. He won nine in a row if you don't count the Indy 500, which in those days (1953) was part of the world championship. Thanks, David! The other comment is on Peter Sauber's skill as a forecaster. Not long ago he said that podium finishes for his team were out of the question, not to be expected this season. I'm sure he was happy to be proved so wrong so soon! Speaking of Sauber: I think this guy Raikkonen is the real deal. Okay, I admit that something about him seriously prejudices me in his favor. Have you heard him interviewed? Here is a dry, calm and cool character. He communicates immense laid-back confidence. What impresses me more, though, is his voice. It's high-pitched and a bit raspy - just like a certain Juan Manuel Fangio. And you know what kind of race driver he turned out to be. Kimi's built just right for today's cars at 5 feet 9 inches (175 cm) and 137 pounds (62 kg). Raikkonen hasn't had that bad a start to his 2001 season. He was in the points at Melbourne and qualified in the top ten at Sao Paulo - not too shabby. It's noteworthy I think that in the middle sector at Interlagos, where cornering and handling count, he was eighth fastest. He was quicker than Heidfeld there and only 0.016 second slower than David Coulthard's McLaren. That puts him in some pretty good company. It's a good result when you consider that he's racing - like Enrique Bernoldi - under a provisional superlicense, having only driven a Grand Prix car for the first time at Mugello in September of last year. You'll remember as well how many experts stepped forward to say that it was very risky to let Raikkonen loose in one of these powerful cars when the hottest thing he'd raced before was a Formula Renault, and that only since the 1999 season. He admitted that his first Formula One laps required some readjustment. "My eyes and my brain were not ready," Kimi said. "Everything was so different on the first day - the speed, the brakes, the wind in your face. The most difficult thing was how the corners come at you so quickly, your brain hasn't noticed. But then, after a night's sleep, everything slows down. Your eyes are used to it, your brain catches up and it becomes easier." Before the season started he tested over 988 miles (1,590 km) for Sauber, experiencing only one spin. Raikkonen is another reason to praise karting as a way forward in racing. Kimi has been racing carts since 1987, when he was all of seven years old. Since then, year on year he's risen through the Finnish karting ranks, ultimately driving some machines with a pretty punchy power to weight ratio, thank you very much. Above all, karting teaches you to keep all four wheels on the black stuff and to exploit the circuit to the full. As we have seen, this has been superb training for Raikkonen, who has excelled at getting to know new Grand Prix tracks. I have to agree with Martin Brundle, who said of Kimi that "his coolness and confidence are just staggering." The Finn admitted at first that a Formula One car presented him with a lot to learn, but he has taken it all on board with exemplary speed. He's demonstrating racecraft on the tracks, as he showed at Melbourne by overtaking one of the drivers who is hardest to pass, Jean Alesi. Raikkonen has some other things to work on, such as his starts, but that will come in time. I'm assuming, of course, that his superlicense will be confirmed after Imola. As Brundle said, it should have been confirmed after his first lap on the first practice on the Friday of the first race of 2001.